· The reference list is located at the end of a paper, assignment, article or thesis. · Every reference must have enough information for the reader to find the source again. · A reference list is different from a Bibliography in that a bibliography is a list of all references consulted in preparing the document whether cited or not. i. 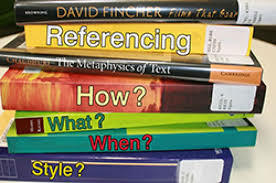 A book reference must have an author, year, title, edition (if it is not the first edition), place of publication and publisher - while a journal article reference never has a place of publication or publisher but must include journal volume, issue and page(s) number(s). iv. The layout, punctionation and capitalisation of all references must be consistent. Maximum Capitalisation for Journal titles. (Capitalize the first letter of all words other than conjunctives(and, of, or, etc..)).